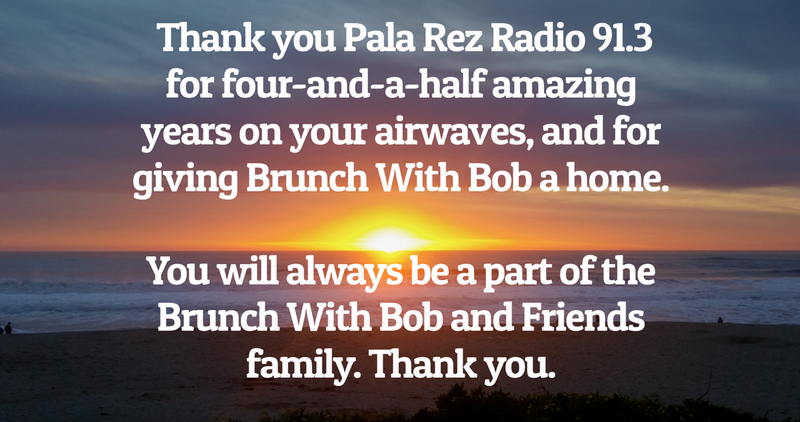 When Brunch With Bob and Friends was looking for a new radio home in 2012, Rez Radio 91.3 at the Pala Band of Mission Indians in north San Diego County offered us everything we wanted and more, with digital platforms and applications that helped grow Brunch With Bob and Friends into a worldwide brand. We can't begin to say thanks enough to our friends at Rez Radio 91.3, especially John Fox and Eric Ortega. As a show, we were extremely proud to stand with the Pala Band of Mission Indians against the-then proposed Gregory Canyon Landfill along the San Luis Rey River. Thank you to Rez Radio 91.3 for the steady hands and steady ears over the last four-and-a-half years. You're a part of the Brunch With Bob and Friends story, and will always be part of the Brunch With Bob family. We are grateful. A big thanks to Leorah Gavidor of the San Diego Reader, a long-time fan of Brunch With Bob and Friends, who penned this piece in the Nov. 25 edition of the San Diego Reader on Brunch With Bob and Friends, and the rise and reach of internet radio outlets, focusing specifically on Rez Radio 91.3. Check out the article here, and thanks again to Leorah and her husaband Irvin, who even tuned into Brunch With Bob and Friends on-line while visiting Tel Aviv, Israel, just to get a taste of home while they were on vacation. Great quotes and content as well from Rez Radio program director John Fox and APD Eric Ortega, who also serves as the executive producer of Brunch With Bob. First we hit a decade on the air. Now we're at 11. Let's face it, this is a big deal. Turn up the amps! Feb. 2015 marks the 11th anniversary of Brunch With Bob and Friends, which has grown into one of longest-running and most beloved radio shows in San Diego. When Brunch With Bob first aired on Sunday, Feb. 8, 2004, on the original incarnation of FM 94/9, we never imagined it would grow into the community it is today – but even then we knew we were on to something special. The reason Brunch With Bob and Friends remains one of San Diego and Southern California’s most enduring radio shows is because of you, your enthusiasm and your sense of community. Listen to Brunch With Bob and Friends Sunday mornings from 9 a.m. to 12 noon on commercial-free KOPA Rez Radio 91.3 in San Diego, or listen on the Brunch With Bob and Friends app. You can easily listen to the San Diego broadcast of Rez Radio on-line at iHeartRadio or on Rez Radio's in-house, locally-hosted webstream. Thank you for continuing to make Brunch With Bob and Friends a refreshing, thoughtful and happy addition to your weekend. Tommy talking about Brunch With Bob on U-T TV in 2014. Big thanks to 102.1 KPRI morning host Chris Cantore and producer Sean Smith for bringing Tommy Hough on board for a daily Mandatory Marley feature, powered by Brunch With Bob and Friends. Each weekday morning at 8:20 Chris and Tommy knock back a few cups of strong coffee and introduce a Bob Marley song of the day. 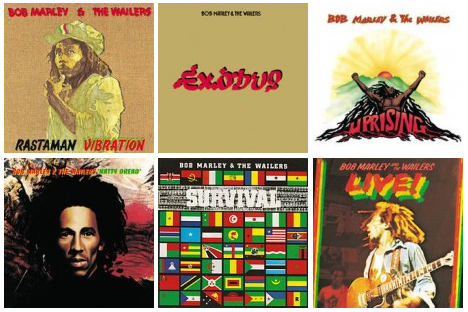 As the host of the long-running Brunch With Bob and Friends show, no one in San Diego is better versed on the songs or catalogue of Bob Marley and the Wailers than Tommy Hough. And matching a daily dose of Bob Marley to the KPRI morning show with Chris Cantore creates a perfect match for San Diego commuters and music fans everywhere. Tune in for a daily dose of Brunch With Bob and Friends on the new Mandatory Marley daily feature, weekdays at 8:20 am on the KPRI Morning Show. A fun, excited, and patient crowd helped make the 10th Anniversary Broadcast of Brunch With Bob and Friends a big success, and the live broadcast from the Catamaran in Mission Beach set a template for future Brunch With Bob on-location shows. Thanks again to the Catamaran Resort Hotel and Spa in for hosting our 10th anniversary special event and live broadcast on Sunday, Feb. 23. It was a great locale perfectly suited for the show, and a great time. Big thanks to all the Brunch With Bob fans and friends of the show who came out to join us Sunday morning on the shores of Mission Bay. We hope to do another live event soon, prompting the question: Which San Diego establishments would you like to see Tommy take Brunch With Bob and Friends next? Let us know at our social media outlets on Twitter and Facebook. Brunch With Bob and Friends is heard Sunday mornings from 9 a.m. to 12 noon on Pala Rez Radio 91.3, as well as on Rez Radio's iHeartRadio channel, on Rez Radio's in-house webstream, and on the Brunch With Bob and Friends smartphone app. Thanks to all the Brunch With Bob and Friends loyalists for your patience as we put the 10th anniversary live broadcast together.